Street and castle of Stolberg. 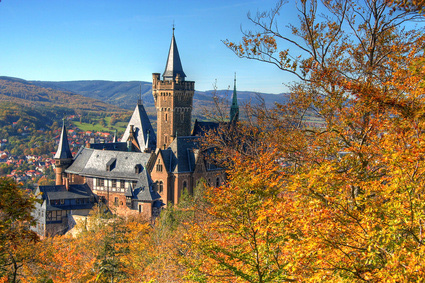 Founded in the year 1000 as mining settlement deep in the Harz mountains, Stolberg became the seat of a county in 1210, then of the Principality of Stolberg-Wernigerode. The pocket-sized town is dominated by the grand Renaissance castle. Stolberg Castle is open all year round, daily (except Mondays and Tuesdays) from 11:00 am to 4:00 pm (to 5:00 on weekends and public holidays). Evening guided tours take place every Friday from 8:00 pm.